All new redesigned! The number 1 Throwing Training aid in the world. Correct poor throwing mechanics. Teach players to throw properly. The ThrowMAX is the world's only flexible arm brace made of extremely lightweight material that fits directly on a ballplayers arm. It supplies resistance which provides instant feedback as to the correct and incorrect motion of a player's throwing motion. 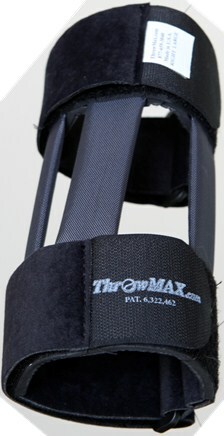 The brace gives a player an immediate response if they try to shortcut a throw. XS - up to 4'7"
S - 4'8" to 5'2"
M - 5'3" to 5'8"